Unlike other companies in the aviation acoustics industry, Aerocon is not simply a material vendor. While we do supply materials and kitted parts, our primary business is making aircraft quiet. To do so, we employ a three-phase design approach to reduce interior noise in aircraft as effectively as possible. The first phase works with the aircraft’s interior arrangement and the designers, the second deals with the related systems and equipment, and the third develops a thermal/acoustic insulation system configured to work with the interior and system designs while providing peak performance exactly where it’s needed. We hope the following information can provide some assistance in your selection of a noise reduction system vendor. Does the solution fit the mission profile? Most vendors attempt to use existing technology and designs whenever possible, in order to cut costs and reduce time-to-market. While this is often a viable approach, it can have disadvantages if not executed properly. Specifically, the utilization of existing “generic” designs often mandate a large amount of cutting, fitting, and other modification on-site in order to achieve the overall design goal of a quiet aircraft. Often, the labor, engineering, and production tracking resources required outstrip the cost savings in using generic technology. Additionally, some vendors may not have adequate engineering resources to accommodate the wide range of design support tasks required to make such changes and modifications. It is advisable to ensure that the vendor has in-house structural, weight, stress, ECS, and design engineering staff, including FAA designated engineering representation (DER) capable of responding quickly and efficiently to the specific needs of the VIP market, and that the internal cost i mpact of using such a vendor is known. Does the solution adequately address the entire scope of noise reduction? Many of the STC’d designs currently available deal only with a single noise reduction element, namely thermal/acoustic insulation blankets. While this is a critical element in most noise reduction plans, it is not the only one. Environmental control systems are another significant contributor to cabin noise, as are various types of minor interior systems. Simple items such as acoustic curtains and close-outs can also make a big difference. However, most insulation kits do not include these, as their scope falls outside of the primary business focus of most insulation manufacturers. Aerocon suggests that you, as the customer, ensure that the vendor has the ability and expertise required to fulfill all facets of the noise reduction plan. It is important to ensure that each element of the noise reduction plan is properly certified as well, to avoid last-minute changes to the aircraft’s overall certification plan and production schedule, and to eliminate the risk of receiving unauthorized parts. Does the vendor have the resources to accommodate the project’s requirements? A noise reduction program for an aircraft, in order to provide the best possible results, must address many issues, and will affect and be affected by most of the cabin systems, structures, and equipment. This translates into a high level of specialized design, engineering, manufacturing, and certification resources required of the vendor. Aerocon has established and maintains a comprehensive network of partnerships with material developers and manufacturers, which, as directed by our core engineering staff, allows us to scale rapidly to accommodate any customer order without the burden of a large overhead. Aerocon takes a step-by-step approach to quieting aircraft. This approach has shown to be the most effective, for the least effort, manner by which to achieve the lowest possible sound levels. Supplying of design drawings, aircraft data, and collection of required measurements. Data is then analyzed to provide the design basis for the Noise Reduction Plan. In order best to achieve the customer's sound level goals, Aerocon first prepares a Noise Reduction Plan. This document categorizes each task required to achieve reductions in specific systems and areas, ensuring that they keep with the overall goal of the project. 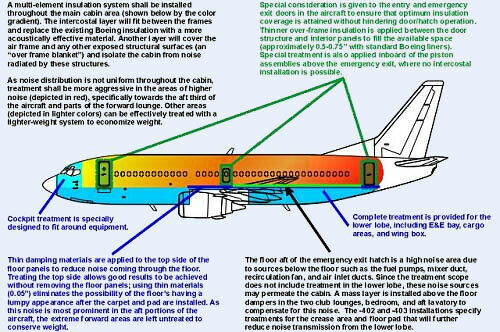 It is written in an informal style, as it is intended not only to be used as guidance and interface to the engineering teams involved, but also to give the customer a good understanding of the application of acoustics to his or her aircraft. As many facets of aviation acoustics are not well documented, end users, owners, and operators often do not have the tools at their disposal to make beneficial decisions. The Noise Reduction Plan provides just that. Create certification, milestone, and test plans required to obtain STC. Perform the necessary production tracking and conformity inspection required by the certification plan. Monitor the implementation of the noise reduction plan, and make minor changes as required during installation to meet specifications and/or comply with customer desires. Monitor the completion center's design team to determine the acoustic impact of design changes, and assist in the resolution of any problem areas. Maintain an accurate log of the weight of each installed component to ensure compliance with specifications. Also for use in final weight/balance calculations. Systems that emit a higher than normal amount of heat, or which need additional protection. As any change to an interior element may have an impact on the customer’s design and production, Aerocon will work closely with the customer to arrive at mutually agreeable solutions. Often, the union of Aerocon’s engineering knowledge and the customer’s knowledge of the interior and its requirements can provide solutions that would otherwise not be discovered by either company, acting alone. Additionally, this technique can be applied to, among other things, the choice of interior finishes (e.g., covering materials and veneers, flooring, etc), with good results. Enviromental control system noise reduction kits typically include damping and insulation materials, flow diffusers, mufflers, and any other materials required to eliminate noise in the main cabin portion of the ECS, as described below. The remaining elements of the ECS, specifically those below the cabin floor, can also be treated. The entire environmental control system is first analyzed by Aerocon engineering, to determine the proper placement and configuration of the parts. After installation, the system shall be tested in flight, and any supplemental modifications made prior to final validation. 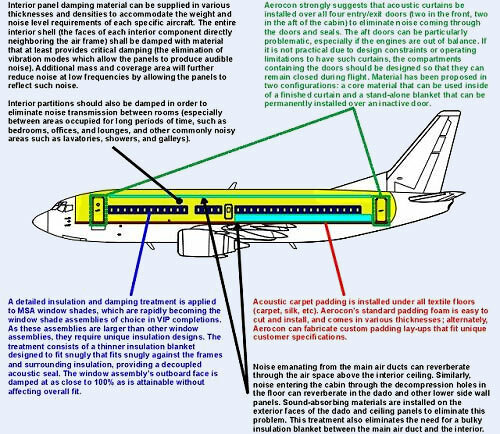 Although the FAA has identified that the maximum benefit from burn-through protecting materials will be felt in the lower half of the aircraft (the area that would be impinged by flames from a post-crash fire, accounting for the failure of one or more landing gear elements), many customers have expressed concern for extreme circumstances where the top half of the aircraft may be exposed to fire (as in the case of a roll-over crash).In response to such concern, Aerocon can provide optional burn-through protection for the entire aircraft. This protection is incorporated into the insulation system at the time of manufacture, in order to minimize cost and weight. Other fire-blocking bulkheads can be included as required by the aircraft's specific mission profile.